Attendees in 1936, practicing a "charming" walk and posture, at a London finishing school. I have a friend who was always identified as “an American woman” by the local men when she traveled abroad to Italy and France. Curious as to how the always knew she was American before she ever spoke to them, she asked them just how they knew. “American women walk like men, not women.” they replied. Wow! That's very telling. It got me to thinking: Is how we walk just as important as our focus on walking to get where we are going? I decided to dig through my old, bygone era, charm-school books and see what they had to say about a woman's walk. 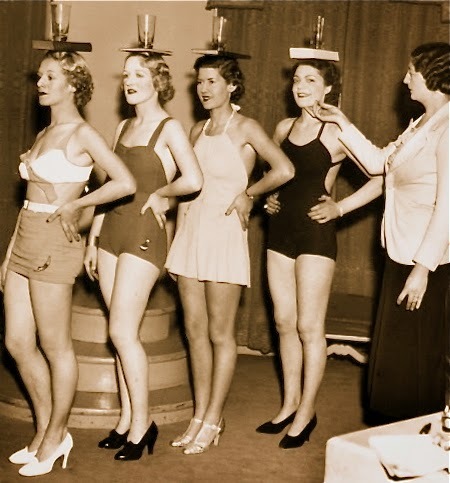 I wonder if we can still apply these techniques today, with, or without books on our heads? Corseted or not, we need to amend how we walk. 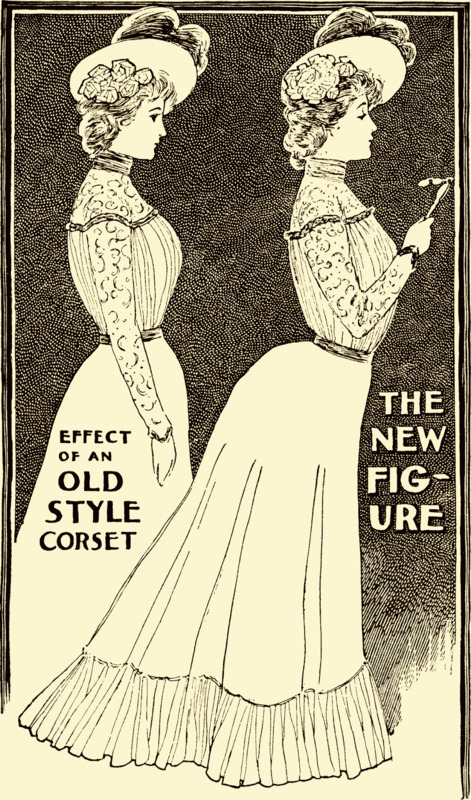 As pointed out by a friend, undergarments like corsets and girdles affected how women walked when this book was published, however, corseted or not, I strongly feel we need to amend how we walk today, because there is something to be said for a woman walking gracefully while getting to where she needs to go. One can use a piece of chalk or a strip of tape to create a straight line for practicing the correct walk. 1. The body must be correctly aligned, with the back as straight as possible. To start, the knee bone should be over the ankle bone, the hipbone over the knee bone, shoulder bone over the hipbone and the head over all. Maintain this torso alignment while the legs are in motion. 2. 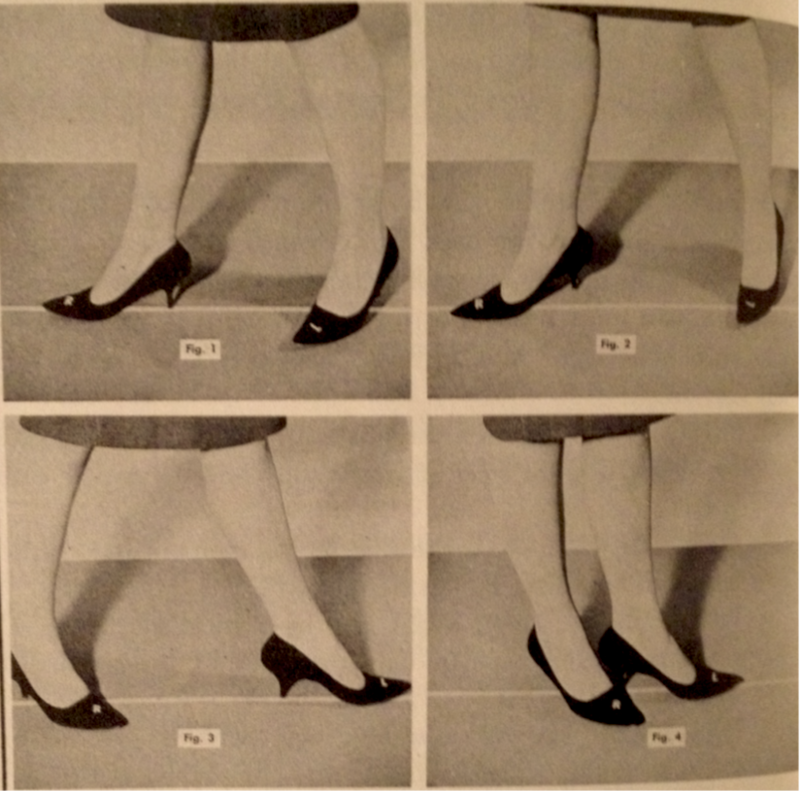 The step should be no longer than your own foot so that the distance between the heel of the forward foot and the toe of the back foot this not exceed the length of the foot. Do not reach for your steps and do not mince along. 3. The toes should point straight ahead or be turned slightly outward as models and dancers walk. 4. There should be no perceptible change of weight from one foot to the other. This can be best achieved by keeping the weight on the balls of the feet and by "pushing off" with the ball of the back foot. 5. The knees are kept flexed so that they may act as the "spring" for the body to give a smooth, glide appearance. 6. One foot is placed directly in front of the other on one line. This method gives a feminine look, and when done with balance and grace, might be called "showgirls walk." 7. The legs swing forward from the waistline so that the hips also move forward and forward. They do not move from side to side, nor do they undulate. This avoids hosiery rub. When the right leg comes forward, the right hip comes forward. 8. The arms move in opposition to the feet for balance so that when the right foot is forward, the left arm swings forward and vice versa. The hand should swing forward to the toe and backward to the heel. The more vigorous the walk, the more vigorous the hand swing. 9. The arms should swing relaxed from the shoulders with the elbows held fairly close to the body, but not tight. They should remain relaxed should not bend as the arm comes forward. 10. Float from the waistline up. Walk from the waistline down. The head, shoulders and upper torso move forward smoothly as though disconnected from the rest of the body. The control of the walk comes from the midriff, and the leg moves forward from the waistline. "From here on out, your success will depend upon practicing the foregoing techniques until you have a 'naturally' beautiful walk. Your walk tells a great deal about you. It reveals carelessness, timidity, shyness, aggressiveness; for it can bespeak the loveliness of you. It is worthwhile to learn "to walk in beauty.'"